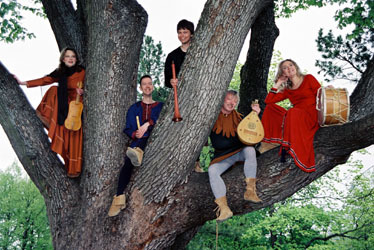 Oliphant is a medieval music ensemble, founded in Finland in 1995. The members are professional musicians specialised in early music. Oliphant’s repertoire consists of music from the 12th century to the polyphonic ars nova. Although the group has played a great deal of well known music from the middle ages, it has also been studying and performing a lot of forgotten songs, which members of Oliphant find very important. Oliphant has been giving concerts at several music festivals and has even played some Finnish modern music first performances (with medieval instruments). Besides its own concerts, Oliphant has participated a couple of bigger productions, for example the liturgic drama Ludus Danielis, which is a kind of opera from the middle ages. Oliphant's style of playing is based on improvisation and is colourful, which has been very well accepted by both the audience and critics. Oliphant's first CD, Songs from the Crusades, was nominated in 2000 as one of the Recordings of the Year by a major Finnish newspaper, Helsingin Sanomat. It also received enthusiastic reviews in Early Music Review magazine and on MusicWeb. Oliphant's second CD, Gace Brulé, was published in 2004. Oliphant studied all of Gace Brulé’s about 90 songs, and selected 14 of them to be recorded on a CD. The CD has already been selected as the recording of the week by Classic FM (a Finnish radio station) and received excellent reviews in several newspapers and magazines, including Hufvudstadsbladet, Helsingin Sanomat and Classics Today. Oliphant's third CD Joie Fine was published April 2006. It contains medieval pious trouvère songs. Also this CD has received very positive reviews by Hufvudstadsbladet, Helsingin Sanomat and Rondo.